I co-coached my son’s blastball team last year. We spent a lot of time playing blastball, but we also spent some time practicing some of the skills needed to be able to play (while emphasizing how these skills fit into playing the game). One of the skills we practiced was throwing and catching a blastball. How this worked is that each kid stood one or two steps away from their parent and threw the ball to their parent. If the parent caught it, the parent took a step back, and threw the ball back to their child. If their child caught it, the parent took another step back, and so on. This meant that very quickly parents and children tended to be separated by a distance where they catch the ball about half of the time. This is by itself a good activity that relates to the number line, if you think of each step apart being 1 space apart on the number line. 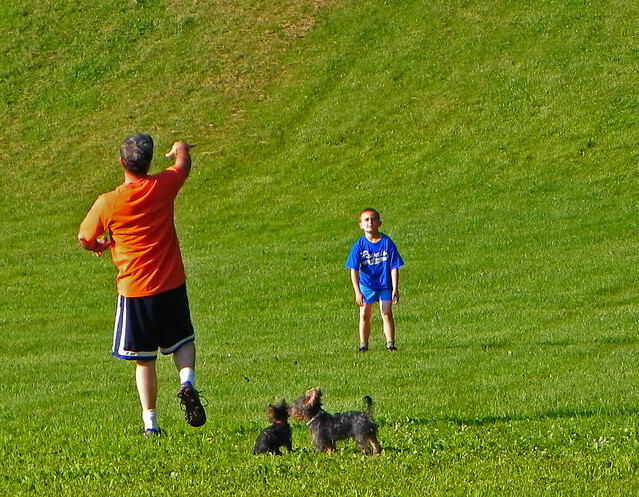 My son and I went through a particular fun exchange where his objective was to make sure I didn’t catch the ball, requiring me to continue closer to him. As I moved closer to him, I kept indicating where I was like so: "Okay, now I am three steps. Now I am at two steps." Eventually, I ended up zero steps away from him. To continue the joke, he managed to find a way for me not to catch the ball even though we were directly on top of each other. I continued stepping toward him, which meant that we were now facing back to back, with one step in between us. "Okay," I said, "now I am at negative one step." He had lots of questions about negative one step, and continued the game a few more times as I moved into smaller and smaller negative numbers. While the introduction of the concept of negative numbers is obviously secondary to this activity, it is a way to tie together some fun physical activity with some conceptual understanding of the relationships between different numbers. I’ve read a lot of articles over the past few years about education is being disrupted. Most of these disruptions are focused on schools as systems (think financial disruption, not pedagogical disruption), not schools as ecosystems. The distinction is important. I’d like education to be disrupted as well, but I think in some ways that are much different than what many education reformers are pushing. I’d like every student to have a teacher, a school, and to feel comfortable to be in that space. For my school’s partner school in Kenya, we’ve put up a wall to add a level of security to their school, but it would be nice if all of the students had access to latrines, clean water, and food. When we can fix this problem everywhere in the world, I’ll consider education disrupted. Note: I’m also in favour of ensuring that the education we provide everywhere is suited to the needs of the local communities the schools support. I’d like every student to feel safe to speak their mind in front of their teacher, and to feel safe in their presence. In too many places around the world, corporal punishment is still acceptable, and students are taught obedience over independence. It is possible to know when to follow the rules, and not have to sacrifice the ability to reason independently. I’d like Neil Postman and Charles Weingartner’s chapter 12 of this book (at least) to be required reading for every teacher. Teachers (and parents) need to at least be discussing their role in quelling the questions of students. We need to recognize that Daniel Pink’s idea of "Autonomy, Mastery, and Purpose" as drivers of human motivation, especially for highly demanding cognitive tasks, does not just apply to adults, it applies to students as well. Unfortunately most schools do not give students opportunities for any of these three guiding principles of human motivation. How often does your school let students completely master a skill before moving onto the next skill? How often do students have choice in when, how, and what they learn? How often is the purpose of school given so base that it does not actually invite students to participate?